Dynarex BZK Antiseptic Towelettes freshen and cleanse the skin with its powerful antimicrobial Benzalkonium Chloride solution U.S.P. It effectively kills microorganisms to prevent spreading of germs, sickness and infection. When needing a fast skin antiseptic, the packaged single-use towelettes add convenience, especially when there's not access to soap and water. Skin Cleansers also prevent infection and using the towelettes is a helpful for women for post-partum perineal care. It is alcohol-free and therefore won't sting. 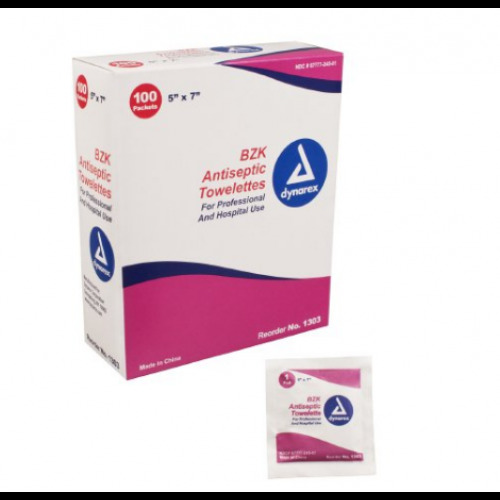 The 5 x 7 inch Towelettes (Dynarex 1303) are available for purchase in a box of 100 wipes. You may also be interested in general wash-up Cleansing Towelettes for professional and hospital use. Contains: Benzalkonium Chloride Solution U.S.P. Everytime I order Dynarex BZK's at least a 3rd of them are dryed out the rest dont have much solution on them at all. They may be cheaper but you end up paying more in the long run. The same goes for their dynalube. 7 out of 8 boxes I got were coagulated. In other words the jell was all clumped together and I couldnt use it unless I warmed up the packet first. Dynarex is a cheap product that you end up paying more in the long run because most of it is bad. I dont think they have any quality control at their company. Purchased these to replace 10 year old daughters liquid benz. chloride that Claires sold us for her pieced ears. She prefers the pads rather than using cotton balls and the liquid. Excellent product and she is pleased with them. Convenient wipes for pre-catheterization cleansing. These convenient and affordable little wipes are perfect for cleansing prior to catheterization. The active ingredient is the same as what is provided at the Urology office. Vitality has the best price around for these. These are easy to use and not as messy as povidone iodine wipes/swabs. These are perfect for my use...affordable and convenient.